Have you read that chart over there? Read it, I’ll wait. Did you notice? NO artificial flavors. NO preservatives. 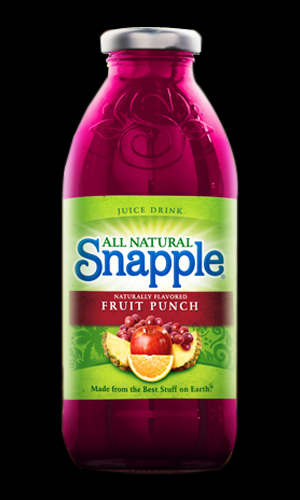 NOthing like that in this bottle. Just real ingredients, which is why we say we’re Made from the Best Stuff on Earth®. † Not a significant source of Calories from Fat, Saturated Fat, Trans Fat, Cholesterol, Dietary Fiber, Vitamin A, Vitamin C, Calcium and Iron. ‡ Percent Daily Values (DV) are based on a 2,000 calorie diet. 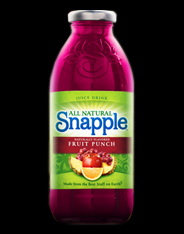 FILTERED WATER, SUGAR, GRAPE JUICE CONCENTRATE, NATURAL FLAVORS, RED GRAPE JUICE CONCENTRATE (FOR COLOR), CITRIC ACID.